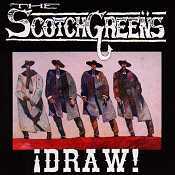 In Music We Trust - Scotchgreens, The: !Draw! Lo-fi indie rock meets its match when it goes eye to eye with whiskey-soured rockabilly on The Scotchgreens' !Draw!, an album too loose to be considered rockabilly, but too macho to be considered lo-fi rock. Instead, it mixes elements of both - with the proper punk upbringing - to deliver spring-y, country rockabilly sure to make you drink more than you can hold and offend one or two souls in your quest to dance to the Scotchgreen beat. "Hot As Texas" is paper thin and too quiet to give a true rockabilly cat a buzz. Yet, it's too rockabilly for fans of old country to really dig it. Instead, it opens itself up to a new breed of country crooners and rockabilly cats to dig. "Lone Wolf" pumps some gas into the machine, delivering a fast, wickedly wild romp. And "Tarantula" scorches like the surface of the sun with its sweltering guitars and dizzy-ing rhythms. Enough country to get you drunk and enough rockabilly to make you wobble around for the night, The Scotchgreens are stuck in the middle, and proud to be there. Never one thing or the other, the band can't make up their mind, but it works in their favor. I'll give this a C+.